Australia's most awarded luxury motor yacht builder, Riviera, will premiere its magnificent new 68 Sports Motor Yacht in partnership with Eric Zobel Marine at the upcoming Barcelona Boat Show from 11 to 15 October. 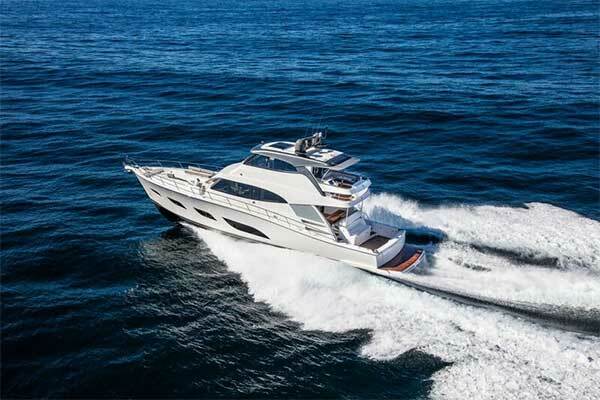 Riviera's International Sales Director Chris McCafferty said the new-concept Sports Motor Yacht has been designed to offer the exhilaration of sports performance, sporting lines and a sporting cockpit. Luxurious appointments combine with the comforts of a traditional motor yacht including wide, high bulwark side decks, a massive lounge area on the foredeck and covered mezzanine dining area. This motor yacht has been designed to exceed CE Category B certification, further enhancing superior offshore capability and extended cruising. "The Sports Motor Yacht collection includes two models, the 68 and a 72," he said. "Riviera is synonymous internationally with the finest luxury interiors, design and innovation, blue-water sea-keeping capability and superior owner enjoyment," said Mr McCafferty. "The new Sports Motor Yacht collection is superb motor yacht technology by any standard." “Riviera is continually driven to enhance the boating fulfilment of our global family of discerning luxury motor yacht owners,” he said. 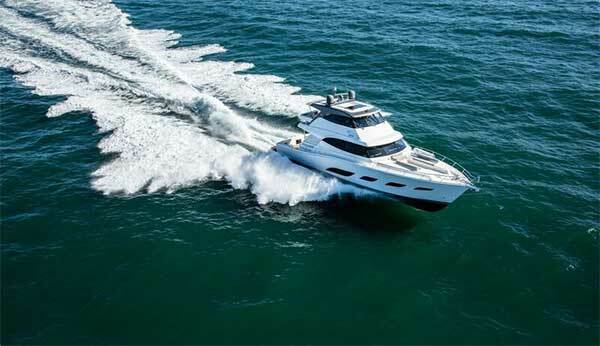 The cockpit of the 68 Sports Motor Yacht offers everything a sports fisher or water sports enthusiast could hope for, including a large boarding platform and twin transom doors as well as plenty of space for relaxing and entertaining. The elevated alfresco mezzanine forward of the cockpit includes a large dining area and is connected with the central U-shape gourmet galley through a stainless steel framed door and large awning window. When the door and window are opened, this area is transformed to one large lifestyle space, positioning the chef at the heart of a social environment. A port side door on the mezzanine leads down to a day head, shower and utility room or optional crew cabin with direct access to the engine room. 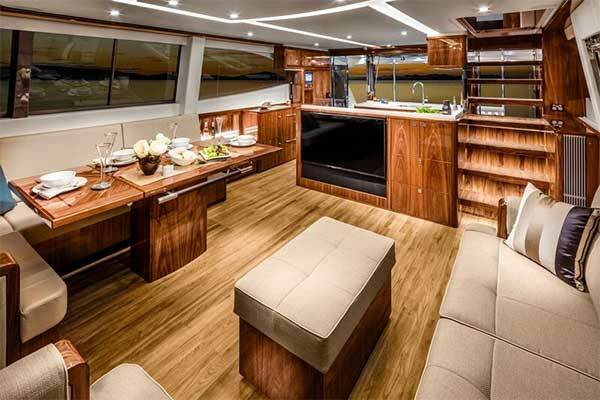 Stepping inside from the mezzanine past the fully-equipped U-shape galley, the saloon features a plush lounge to port and a dining area that can seat up to eight people to starboard. A large TV forward of the galley rises at the touch of a button and can be comfortably viewed from both lounge and dining areas. An internal timber staircase provides direct access to the flybridge, a space in which skipper and guests can enjoy extended passages or relaxing at anchor. The state-of-the-art helm station features comprehensive engine and thruster controls, including the Twin Disc electronic joystick system (EJS), and up to four 22-inch navigation screens. Fully adjustable helm seating comprises a plush central Norsap helm seat and port side companion seat. Guests can relax on lounges across the entire starboard side facing the helm, skipper and an entertainment unit. A special feature of this space is a fold-out double bed secreted under the aft lounge, offering additional accommodation. 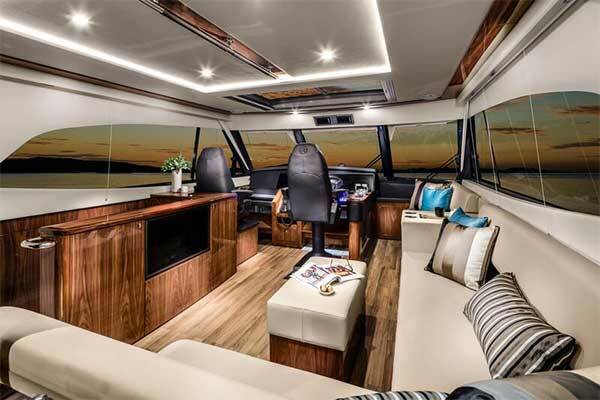 A stainless steel framed glass door and awning window connect the flybridge with a rear deck and alfresco dining area. The accommodation deck offers two stateroom options: the four-cabin Classic or the three-cabin Grand Presidential design with full-beam master stateroom. The Classic accommodation layout offers a midships master stateroom with en suite bathroom along the starboard side while the Grand Presidential design includes a full beam master stateroom with en suite bathroom in the starboard fore quarter. A cabin on the port side forward of the master stateroom features twin single beds. The Classic layout includes an additional guest cabin on the starboard side with two full-size pullman-style beds. The VIP guest stateroom forward includes a walk-around queen-size bed and a private en suite. The Sports Motor Yacht features an array of innovation and technology that includes touch-screen navigation systems, multiple joystick controls for low speed manoeuvring, next generation CZone digital switching which can interface with an iPad for mobile systems control and monitoring, full spectrum feature lighting and optional security cameras throughout the motor yacht. In the engine room, Twin Disc remote-mounted Quickshift gearboxes integrate with the Express Joystick System. V-drives take power to Aquamet 22 Sea Torque oil-filled shafts and Veem five-axis CNC-cut propellers utilising Interceptor technology. The expansive and full head height engine room includes acoustic and thermal insulation and eye-height engine systems monitors and remote controls. Power for this spectacular motor yacht comes from twin MAN V12 1550 turbo diesel engines, delivering 1,550 hp (1,140 kW) each. Two other power options are offered - twin MAN V12 1800 or 1900 engines delivering 1,800 or 1,900 hp (1,324 or 1,397 kW ). Representatives from the Riviera team – including International Sales Director Chris McCafferty and European Sales Manager Jan Van Oostenryck – will be on hand to provide full details of our latest model announcements including the new Belize 66 Sedan and Daybridge, Riviera 395 SUV and 39 Open Flybridge models.